Bone: compact bone. Atlas of Plant and Animal Histology. The extracellular matrix of the osteonic bone is organized in lamellae, which are 3 to 7 µm thick. Lamellae are arranged concentrically around a channel, which is referred as Haversian channel, that contains blood vessels and nerves. Osteocytes, the mature bone cells, are located in cavities named lacunae, which are also arranged around the Haversian canal. Lacunae, as well as osteocytes, are interconnected by a network of thin ducts, the bone canaliculi, enabling communication between osteocytes and the Haversian canal. Unlike others tissues, nutrients do not diffuse through compact bone extracellular matrix and that is why these canaliculi keep alive the compact bone tissue. Lamellae, canaliculi, and osteocytes that are located around the same Haversian canal are together known as osteon (Haversian canal included). Osteon is the structural unit of osteonic compact bone. There are from 4 to 20 lamellae per osteon and the osteon size is variable. Compact bone forms the external wall of bones. As occurs in cartilage, bone is surrounded by a layer of dense connective tissue known as periosteum. 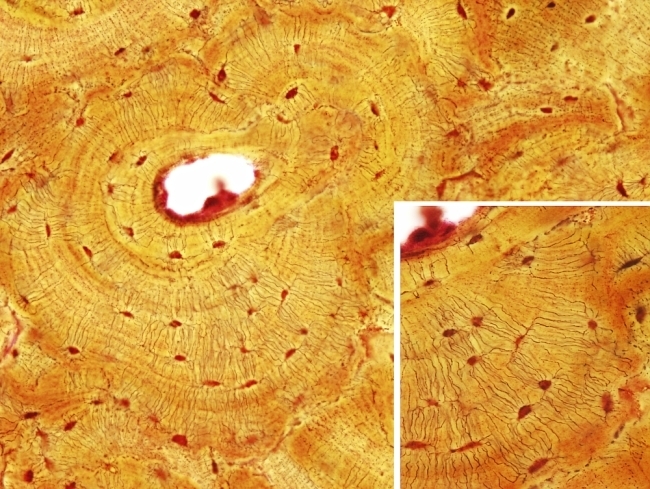 During bone formation, blood vessels enter bone tissue from periosteum. Furthermore, the inner part of periosteum is a source of osteoblasts that differentiate into osteocytes during bone maturation.